The KDE Community is happy to announce that we have been selected to participate in Google Summer of Code. This will be our our 14th year of mentoring students. Attention students: If you are a student who would like to work with KDE this summer you can apply to SoC, find more info on the KDE GSoC wiki page. Please note that your project proposal will need to link to some commits to the KDE codebase, so get started now fixing some bugs! If you are wondering what you can work on, also check out our ideas page. Come and talk to the team on Matrix at kde-soc:kde.org, on IRC in the #kde-soc channel or join the student mailing list. KDE is adopting non-proprietary and decentralized instant messaging services and is now running its own community-managed instance of Matrix. Matrix works fine on mobile as well. KDE has been looking for a better way of chatting and live-sharing information for several years now. IRC has been a good solution for a long time, but our channels are currently on servers KDE cannot control. It also lacks features users have come to expect from more modern IM services. Other alternatives, such as Telegram, Slack and Discord, although feature-rich, are centralized and built around closed-source technologies and offer even less control than IRC. This flies in the face of KDE's principles that require we use and support technologies based on Free software. However, our search for a better solution has finally come to an end: as of today we are officially using Matrix for collaboration within KDE! Matrix is an open protocol and network for decentralised communication, backed by an open standard and open source reference implementations for servers, clients, client SDKs, bridges, bots and more. It provides all the features you’d expect from a modern chat system: infinite scrollback, file transfer, typing notifications, read receipts, presence, search, push notifications, stickers, VoIP calling and conferencing, etc. It even provides end-to-end encryption (based on Signal’s double ratchet algorithm) for when you want some privacy. All the existing rooms on Matrix (and their counterparts on IRC, Telegram and elsewhere) continue to exist. The new service provides a dedicated server for KDE users to access them using names like #kde:kde.org. For more information go visit our wiki page which contains details and instructions on how to get started. You can also try KDE's Matrix service right now by checking in to KDE's webchat or by installing a Matrix client like Riot and connecting to the kde.modular.im server! After many years of successful Google Code-in participation, this year we did it again! 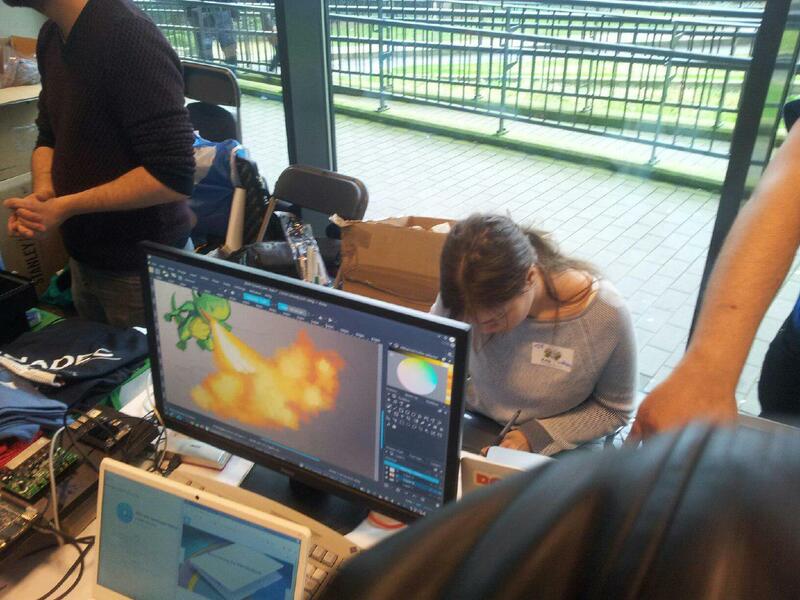 KDE attracted a number of students with exciting tasks for their eager young minds. Google Code-in is a program for pre-university students aged from 13 to 17 and sponsored by Google Open Source. KDE has always worked to get new people involved in Free and open source (FOSS) projects with the aim of making the world a better place. This year was no different. 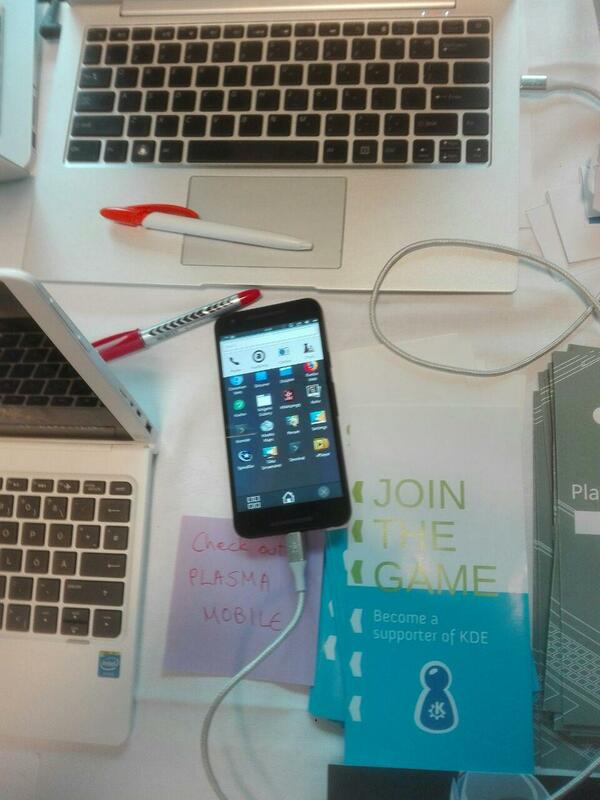 Our students worked very hard, and some of them already have their contributions committed to the KDE codebase! We designed tasks in a way that made them exciting for all students. Students who were not skilled in programming took on tasks of writing blogs or documentation. To help students who had no experience with FOSS or with the community, we set up introductory tasks for IRC and mailing lists, both of which are essential in FOSS as communication channels. The students who had some prior programming experience received tutorial tasks to get a better understanding of how KDE software works. Those types of tasks also helped them become familiar with the Qt framework on which all KDE software is based. 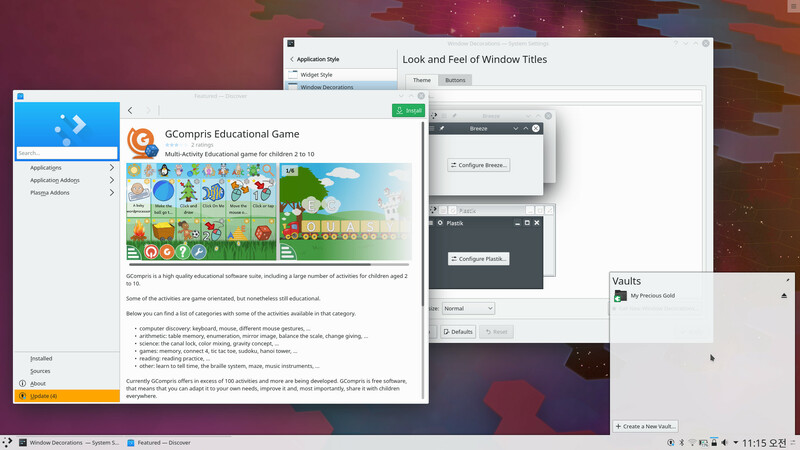 Finally, students good at programming were put to work contributing to on-going KDE projects. They created new features or solved known bugs and wrote unit tests. We’re happy that some really enthusiastic and persistent students joined us this year. Thanks to their passion for programming, they completed many tasks and delivered quality code we merged into our project repositories. It wasn’t easy for the mentors to select winners, as every student had accomplished great things. Still, we finally settled on pranav and triplequantum (their GCI names). Finalists were TURX, TUX, UA and waleko. KDE would like to congratulate all the winners and finalists, and we warm-heartedly welcome all our new contributors! It's that time of the year again. Everyone is in a festive mood and excited about all the new things they're going to get. It's only natural, since it's the season of the last KDE Applications release for this year! With more than 140 issues resolved and dozens of feature improvements, KDE Applications 18.12 are now on its way to your operating system of choice. We've highlighted some changes you can look forward to. File management encompasses a lot of activities. There's renaming, copying, and moving files around. Perhaps you want to quickly preview a file to make sure it's the right one. You're in luck, because the thumbnail preview experience has been greatly improved in the new version of Dolphin. LibreOffice documents and AppImage applications can now be previewed as thumbnails, and icon thumbnails look much cleaner. If folder thumbnails are enabled, video files larger than 5 MB will be visible in them. Of course, there is more to Dolphin than just thumbnails. The "Control" menu makes it easier to show hidden places and create new files and folders. After unmounting a storage volume in the Places panel, it can now be remounted. Those who still own audio CDs and use Dolphin to open them will be glad to hear it can now change the CBR bitrate for MP3 files and fix timestamps for FLAC files. Some security measures have been implemented in Dolphin to prevent users from accidentally losing their data. It no longer allows attempts to unmount the active home directory and the disk where the active OS is installed. When renaming files, Dolphin will warn you if there's an extra dot in front of the filename, which would make the file hidden. Pretty neat, right? 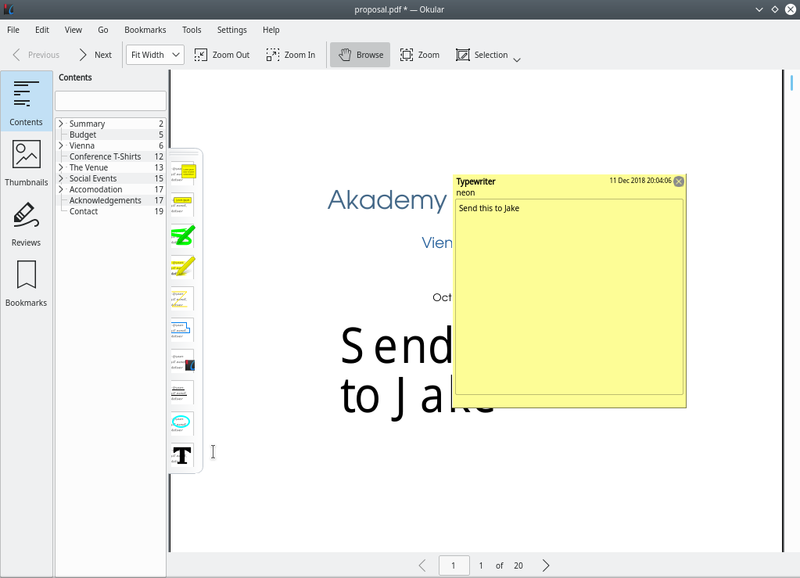 Okular has steadily grown from a document viewer into an indispensable assistant in activities such as studying, doing research, or collaborating on text in read-only file formats like PDF and EPUB. Its annotation capabilities were already powerful, but the new version introduces a new tool called Typewriter. With this annotation tool, you'll be able to write text literally anywhere in your files. Whether it's commenting on an image or highlighting a spelling mistake, your hands are now untied, and you can freely express yourself in Okular. Other improvements in this release include better options to expand and collapse entries in the Table of Contents sidebar. If a file contains links, hovering over them will always display the full URL in a tooltip, regardless of the currently selected Okular mode. Spending hours or even days working in the terminal can get monotonous. Cheer up - the new version of Konsole has full support for emoji! 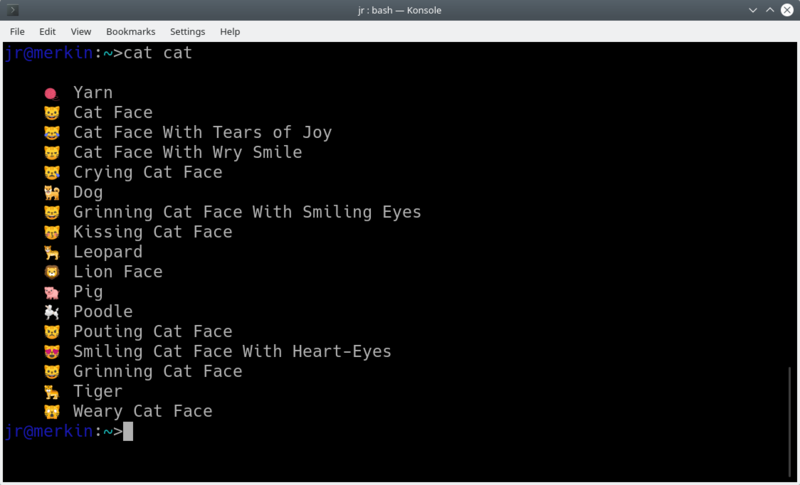 Add a cheeky smiling cat to your commit messages, or insert a facepalm emoji into your shell scripts. If you're into more serious things, Konsole now makes it easier to reset the font size back to the default. When a bell is triggered in an inactive tab, the tab icon will be highlighted to visually alert you of the activity. Last but not least, if your mouse has back and forward buttons, Konsole is now able to recognize them, and you can use them to switch between tabs. If you have been keeping up with KDE-related news, you're probably aware of our community-wide Usability Improvement goal. After all, it's hard to miss the weekly updates from our awesome developers who are dedicated to making the KDE software more accessible and friendlier to everyone. 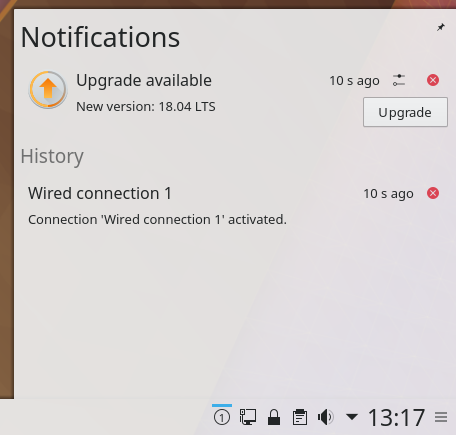 The KDE Applications 18.12 release integrates all those fruits of labor, and the result is a much more pleasant user experience across the board. KMail now supports a unified inbox display, and emails should now be readable regardless of your color scheme. A small improvement with a big impact is the ability to repeat the last calculation in KCalc multiple times. Kate comes with new defaults that are meant to help you work more productively right from the start. Specifically, line numbers and the Text Filter plugin will be enabled by default. You can now change the focus of the embedded terminal in Kate by pressing the F4 key, and it will automatically synchronize the location in the terminal with the location of the currently active document. If you are using Gwenview to fix the wretched red-eye effect in your photos, it will now be even easier thanks to the improved Reduce Red Eye tool. When taking screenshots with Spectacle, their filenames will be sequentially numbered by default. 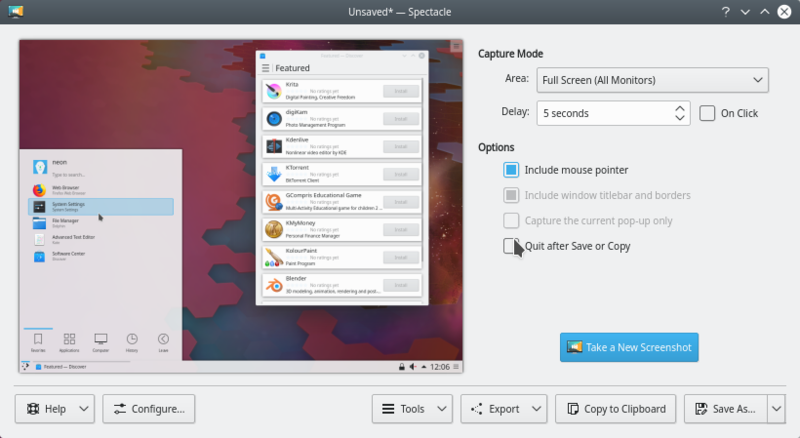 You will also notice that saving options in Spectacle are now easier to access from the Save page. Ark has received support for tar.zst archives, and it's now much smarter when it comes to file previews. Instead of previewing document files as archives, Ark will now launch the appropriate application for the selected file format. Apart from improving the standard set of applications, we have also made some of our specialized tools more usable. Lokalize, the translation and localization tool, now has a better search functionality that can recognize plural forms of words. If you keep a lot of tabs open in Lokalize, you will be able to navigate between them much faster. Cantor, the advanced mathematical tool, now offers better visualizations and highlighting of command entries. You can also open multiple files in one Cantor shell. For users who need to draw mathematical functions, we have made Kmplot more stable and improved the SVG export functionality. As always, check out the full list of changes in KDE Applications 18.12 to find out more. 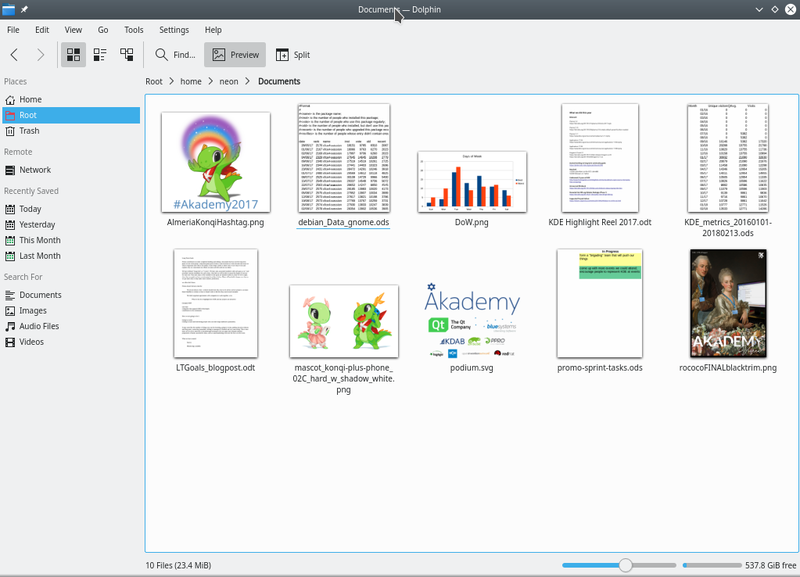 Our work on KDE Applications continues, and we can't wait to show you what we've created in 2019. Until then, enjoy the Applications 18.12., and let us know which changes made you the happiest! On the 2nd of December, the Kdenlive team will be holding an open bug-squashing day in preparation for the major refactoring release due in April 2019. Everybody is invited! This is a great opportunity for developers of all levels to participate in the project. The team has triaged hundreds of reports, closing more than a hundred of them in the past month. Kdenlive developers have also made a list of entry-level bugs you can get started with. For the more seasoned developers, there are plenty of options - be it a shiny feature request or a challenge to polish some non-trivial edges. 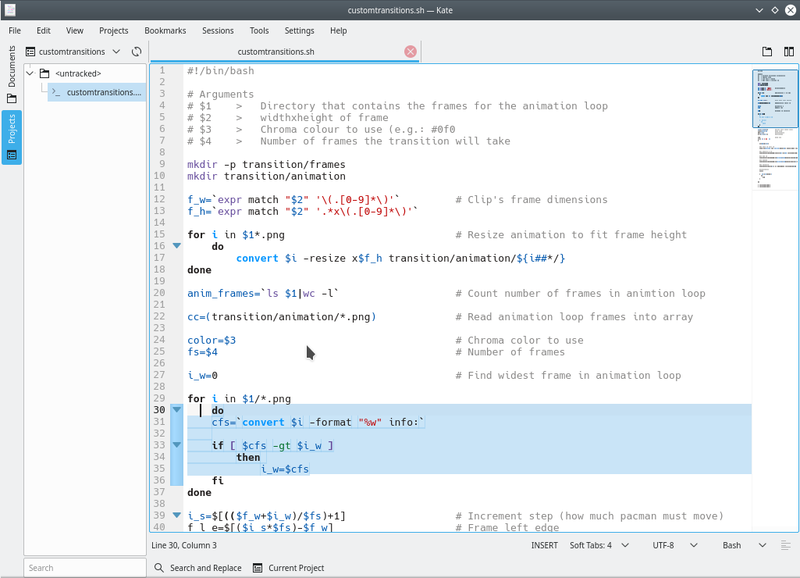 To hack Kdenlive, you need to know C++, Qt, QML or KDE Frameworks. Those with knowledge of C can join the fun by improving MLT, the multimedia framework Kdenlive runs on. Even if you have no programming experience, you can still help by testing fixes and features, as well as by triaging more bug reports. Check out the list of proposed bugs to solve in our workboard under the "low hanging / junior jobs" section. Spread the word and join us! All the information on how to join is here. Read more about Do your part! Squash bugs for Kdenlive!